This article originally appeared on This Dog's Life, a discovery platform highlighting amazing brands while providing dog lovers original, local and national content along with curated stories from across the web. 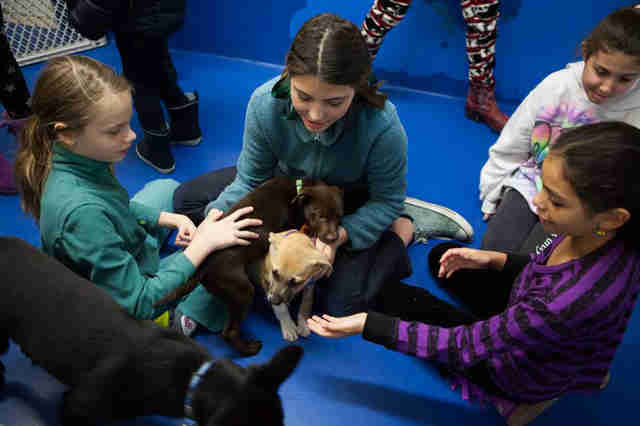 New York City has its share of rescue organizations. Indeed, in the Mayor's Alliance alone there are well over 100 groups looking to make a difference in the lives of animals. But one organization, Unleashed, isn't your typical rescue. 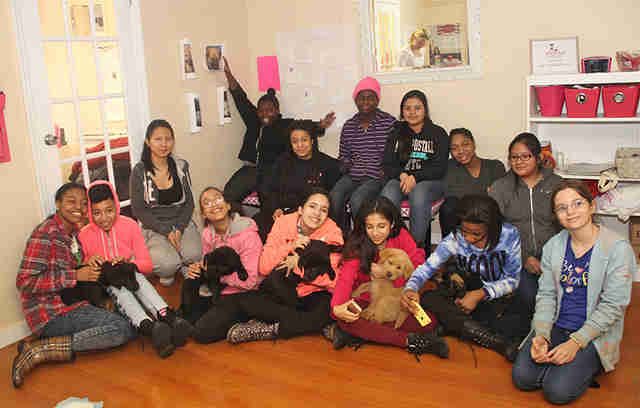 Besides tackling the huge issue of animal welfare, the nonprofit is also taking on the enormous task of helping teenage girls feel empowered. Founded in 2010 by Dr. Stacey Radin, a clinical psychologist and leadership consultant, Unleashed combines puppy rescue with female empowerment. The idea for the program grew from Radin's own research into the relationship between women and power. One of her findings was that early life experience - regardless of environment or background - is integral to the development of the next generation of strong female leaders and change makers. She also discovered that women are more likely to speak up and challenge the norm when they felt passionate about a cause and knew their actions could make a difference in the community. And what really resonated with teenagers? Animal rights and welfare. 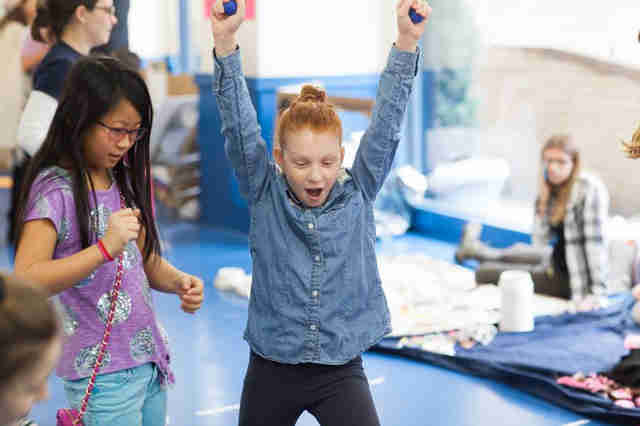 So she decided to combine these learnings and formed Unleashed, an after-school program for middle school aged girls in Brooklyn, Queens and Manhattan. Over the course of their 12-week program girls between the ages of 10 to 15 form discussion groups to develop critical leadership skills. Unleashed coaches - professional women with degrees in fields such as counseling, social work and psychology - help start the conversation about animal rights, and the girls take over from there. They attend panel discussions and hear from expert women in the field of animal welfare. Then the girls vote on the issues each team will focus on - animal abuse, overpopulation, puppy mills or neglect, to name a few - and formulate a plan to educate the community about those issues. "Whether they want to set up a booth at a social justice event, a presentation for their school, write an article for us or for their school newspaper or design posters with pictures, it's all girl driven," Radin explains. This commitment to one-on-one interaction with each pup has contributed to Unleashed's phenomenal success rate: less than 1 percent of the puppies the organization places ever have to be re-homed. Impressively, Unleashed has rescued more than 400 puppies from the urgent lists of high-kill shelters around the country since its inception in 2010. The girls also organize fundraisers like on Valentine's Day, where passersby can donate $15 to spend half an hour snuggling a puppy with their sweetheart. Similarly, the nonprofit organizes educational events, the culmination of which is "Unleashed Leads Day," a festival-like event at the end of the program, which takes place at a local doggy daycare center. During this day, the girls set up booths to educate the community on animal rights issues they've studied over the course of the semester. But Unleashed's initiative is about more than puppy rescue. As part of her research, Radin uncovered an unsettling link between animal abuse and violence against women and children. "If you look at the research about animal abuse, you can see that there tend to be more male perpetrators and that usually there is this correlation with abuse against children and women." Unleashed addresses this head on by putting girls in touch with their ability to affect social change at the exact moment in their development when they need it the most. The discussion around animal rights is the invitation the girls need to talk about feminism and women's rights. Despite the upswing in mainstream feminism's popularity - artists like Beyonce, Taylor Swift, and Lena Dunham proudly declaring themselves feminists, for example, or Emma Watson presenting her #HeForShe campaign at the United Nations - "people still hate feminists," Radin says. "Ours is still very much an 'I'm not a feminist, but ...' nation." Putting the focus on saving puppies offers the girls a safer means of talking about injustice in society. "They learn that when you get down to the core root of things, it's all connected to us humans, and sometimes it's connected to issues humans are facing, such as bigotry, bias, stereotypes or violence," Radin says. The program helps the girls push past the stereotypes inflicted upon them, as well - the assumption that teenage girls are moody, obsessed with being popular, they're shallow or boy crazy. "They are so aware of how people perceive them, and they're tired of it!" she says. Taking part in Unleashed gives them the ability to change that perception. The girls talk about animal rights and rescuing puppies, but they also talk about themselves, their values and what it means to powerful woman in our current society. "Girls take the lead, and the reason for this is because there is no other place in their lives, including school, where they are told can do something and then somebody else backs off and allows them to do it," Radin says. Unleashed is also her version of a feminist movement. "We are coming together under a common platform, which is animal rights, and we're fighting together for a cause but in the interim it does create a sisterhood that transcends generations." The 12 weeks of the Unleashed program is nothing so much as it is a journey, Radin says. "Midway through, the girls sort of look at me and they're like, 'This is not about the dogs, is it?' and I say to them, 'No, it's about you, it's about your power and what you want to see change in the world,'" she says. They start by learning to speak for those who have no voice - the puppies - and in doing so, each one finds her own voice, and the power that comes with using it.